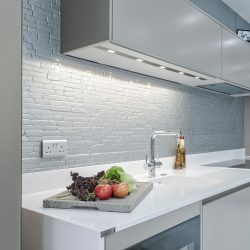 For anyone looking to add a touch of luxury to their kitchen without losing out on practicality, quartz worktops or countertops as they are sometimes referred to as can be the perfect choice. These sleek, stylish worktops offer a modern look to any kitchen but can be expensive. However, the superior quality and number of benefits makes them well worth the initial outlay. Quartz is a crystallised silicon dioxide known for its extreme hardness and resistance to acids. The majority of quartz worktops are made from over 93% crushed natural quartz. The remaining 7% is made up of resin binders to bond the quartz together and pigment to create colour and texture as natural quartz is clear. The non-porous surface makes them easy to clean as liquids cannot soak into the surface. Alternative natural stone worktops have be sealed now and again to create a non-porous barrier; something not necessary with quartz worktops. Being made from one of the hardest minerals in the world makes them scratch and stain resistant too. This makes quartz worktops the perfect choice for anyone looking for a low maintenance kitchen. The quartz used to manufacture quartz worktops is incredibly strong and resilient. It has four times the strength of granite. It also has double the impact resistance of granite. A high impact resistance is important for worktops as items can easily be dropped onto them and ones with a low resistance can quickly get marked and damaged. People can sometimes be wary about having quartz worktops as they worry about the weight of the quartz. It is true that quartz is heavy and that some kitchens would need to be reinforced to take the extra weight. However, there is another alternative that negates the need to strengthen kitchen units. Quartz can be cut as thin as 7mm making it possible to fit it on top of existing worktops. This not only removes the weight issue but is cheaper than solid quartz. Although quartz is extremely hard it is also easier to fit than many other natural stones, in part, due to the resins included. It has more flexural strength to it than some others meaning it is easier to shape and cut. This makes it a great option for any wanting worktops of an unusual shape. It can also be cut in larger sections reducing the amount of joins on display in your kitchen. Quartz worktops offer an extremely practical surface for your unique kitchen design. They are heat resistant up to 160 degrees. The fact they are very easy to clean and are mould and mildew resistant makes them one of the most hygienic choices of kitchen worktop. The amount of colours available means you can find a quartz worktop to fit with any style or colour scheme. Many restaurants and bars have already taken advantage of the many benefits quartz can provide along with the ultra-modern, stylish look it has. Why not give your kitchen the same luxury treatment and see for yourself how quartz worktops combine style, durability and practicality.